Mark Knopfler 1984 Les Paul Reissue - please, Gibson Custom Shop! 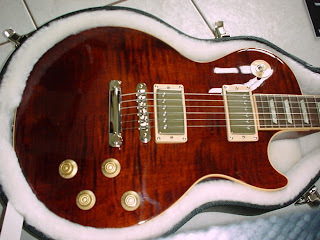 Just thinking out loud: wouldn't it be cool to see a reissue of the Les Paul used by Mark Knopfler for Money for Nothing on Brother in Arms created by the Gibson Custom Shop? 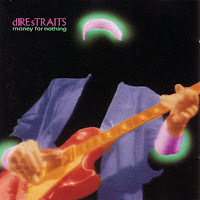 I'd so like to see a reissue of that guitar that sends shiver down my spine every single time I hear Money for Nothing - you know just after that crazy keyboard and drum intro when these crazy things stop and that beautiful G guitar riff kicks in. Very often when I try out a Les Paul, I use that riff. Not passing the "Money for Nothing" test is a deal breaker. And don't even mention the song Brothers in Arms. To me, one of the most beautiful guitar parts ever recorded -the tone, the melody, the feel. 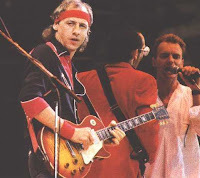 So, I tried to find out a bit more about this particular Les Paul that Knopfler used. While MK owns both a 58 and a 59 vintage Les Paul, then he used a reissue built in 1984 -I'm guessing he didn't have the "real deal" then. So this baby was almost brand new by the time of recording. I hear people complaining all the time about the quality of Gibsons from the 80's. Definitely, this one received particular attention (maybe some sort of masterbuilt). This is a reissue of a late 50ies Les Paul Standard, built in 1984. Mark used it a lot on Brothers in Arms (Money for Nothing, Brothers in Arms). This picture was taken on Live Aid in 1985. Sure, I don't know what a 2009 reissue of a 1984 reissue of a 1959 Les Paul would be like but I'm pretty sure I wouldn't be the only one to put my name on the list for one of those. So, pleeeease Gibson Custom Shop, get this on your todo list if it's not already there! By the way, my birthday is at the end of July...just saying. No join me all of you: I WANT MY. I WANT MY RE-ISSUE! Billy Gibbons Pearly Gates 1959 Reissue Gibson Les Paul - Taking Orders! My friend Jeremy the Tone Baron is taking orders for the new Gibson Billy Gibbons Pearly Gates 1959 Reissue Les Paul! So get in the game and contact him now if you're interested. Another quick find. Unfortunately, I am not in a situation to spend $7,000 on such guitars. I am wondering if they will be selling in this environment. 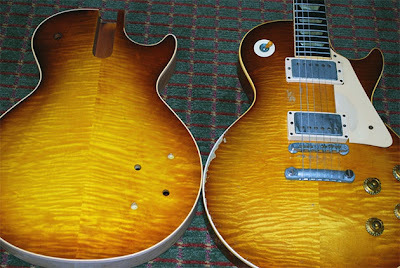 These two Gibson Les Paul's come in finishes you don't come across everyday. I just noticed them on eBay with auctions closing today. Enjoy! From the listing, "The top is made of Muir with a Mahogany back and sides. The fretboard is made of preciosa". UPDATE: The Shark Fin is out. >> Search Gibson Shark Fin on eBay now. Price at Guitar Center will be $1,599 apparently (MSRP $2,299). It seems you can already reserve and order yours. I haven't located more information or a picture yet but will update the blog if I find anything. In the meantime, I have included the listing picture at the bottom which might update when Guitar Center refreshes its content. Could it be an asymmetrical Flying V like a Jackson Randy Rhoads? I am very eager to know. What's your guess? 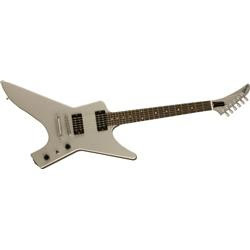 UPDATE: I'm thinking it could be based on the "legendary" Gibson Moderne (a design sister of the Explorer and Flying V) because it is described as a shark fin on wikipedia. I am pretty sure it will launch on July 2nd because Musician Friend has a "Gibson Limited Run Shark Fin Electric Guitar Silver Metallic " and Music 123 has a "Gibson Limited Run Shark Fin Electric Guitar Silver Metallic¹ ". All available July 2nd. it looks like a explorer with a swooping cut a way in the rear and a slightly scalped horn. it has a reverse head explorer headstock with cylindrical "thimble" looking machine heads. the hardware is brushed aluminum. no pick guard. it is seriously a METAL guitar..no holds barred. UPDATE: we now have a real picture of the Gibson Shark Fin! I know I've been silent this week. Reason is that I was on a business trip north of the border. why are Gibson hardshell cases made in Canada? I have been wondering about this since I got my first Les Paul USA in its beautiful brown case with pink plush inside and the "Made in Canada" label. Is this like the US Space Shuttle where the robotic arm is Canadian and sports a nice Canada logo/flag? Like they are not one of a state but we like to include them. Leave your explanation, rational or funny, in the comments! Guild S-300 - for a rich sound between a Strat and a Les Paul? vintage from the end of the 70's. 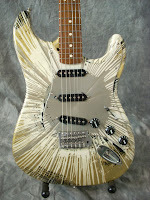 The S300 was the main electric guitar in a line of new designs Guild launched in 77. 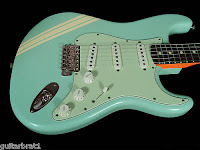 It has an original shape which is kind of a mix of the Les Paul's large curves and the Stratocaster's ergonomic design. It is getting great reviews on Harmony Central. Mainly for its versatility as it can sound anywhere between a Les Paul and a Strat, notably through the use of the factory-installed extra phase switch for reversing pickup polarity. But also for the great wood and set neck that makes it a tone and sustain killer. 's fingerboard is made of ebony. It also has 24 frets which I think was a bit ahead of its time. To me, "24 frets" sounds Ibanez and 80's shredding craze. And I think to some extent the S300 was probably built for a heavy sound. , comes with "mahogany body and neck, DiMarzio PAF and Super Distortion humbuckers" (source). The S300-D version was only manufactured during 5 years from 1977 to 1982.
is without a doubt a great investment for a player who likes a bit of a different look and tone packaged in an innovative guitar -in a time which were clearly not the best years of the big manufacturers. Just note that this guitar has a large scratch. You have 5 days to make up your mind (as of writing). 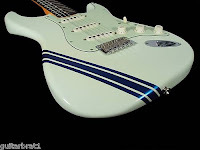 Browsing Fender listings tonight, I just really enjoyed the racing stripes on these Fender Custom Shop Limited Edition 1960's Stratocaster. According to the listing, these four beauties are Closet Classic Limited Namm Edition Stratocasters. They come with a custom neck plate for the occasion. Use the eBay widget below to see all four guitars on auction. They are all at $3,195 Buy It Now with the option to make an offer. So, give it a chance! If being played by Jimi Hendrix is not enough, then Wayne from Wayne's World forever made this guitar iconic. Oh, yes... It will be mine. "It" is the 1964 Fender Stratocaster. And to make it yours, be ready to make a five-figure check. Built for NAMM 2009 to honor the legend of the 1964 Stratocaster, this Chocolate Three Color Sunburst is a limited edition (50 available worlwide). It comes in a Thin Nitro Lacquer Finish, Relic-d to show years of natural wear and tear, nicks, scratches and intricate weather checking. Comes in a Limited Edition Case with a Limited Edition Certificate. Features include a premium Ash body, 1965 C-shaped maple neck with 9.5”-radius dark Indian rosewood fingerboard, clay dot inlays and jumbo 6105 frets, three Master-Built “overwound” Fat ’50s single-coil pickups, five-way switching, American Vintage synchronized tremolo bridge, vintage-style tuners, bone nut and a three-ply mint green pickguard. Unfortunately, the auction is closed on this one but I'll let you know if I see one surface. And anyway, remember: NO STAIRWAY TO HEAVEN! UPDATE: the auction for the guitar described below has closed. >> Search Jimmy Page Les Paul guitars now listed on eBay. Big WOW. A Jimmy Page signature Black Beauty Les Paul Custom "signed and played by Jimmy Page himself" is up for grabs on eBay. That is, if you have $45,000. Yep, you got that right 45 followed by three zeros. That beats the $25,000 for a brand new Jeff Beck Oxblood. But this one has a Bigsby, right. This is number 20 of 25 according to the vendor, who also suggests fingerprints on this guitar are likely Jimmy Page's. Yes, the Jimmy Page. HIS fingers! Extract of the listing below. In the early days of Led Zeppelin, Jimmy Page relied heavily on a three-pickup 1960 Les Paul custom "Black Beauty" with a Bigsby tailpiece. Unfortunately, the guitar was stolen in 1970 at an airport and never recovered. Page has always felt that that particular electric guitar was "the one that got away." Anyway, if you acquire this truly iconic guitar or own one of the other 24 Gibson Custom Shop Les Paul's in that series and you dare play it, you are invited to post a video here. I would be honored. Gibson Les Paul Natural Flame - the Albino Guitar? Just came across this very plain vanilla Gibson Les Paul Standard: a 2007 model with a nice flame in natural finish. This guitar doesn't work for me. Not because I am not a flame type of guy but because the absence of color makes this Les Paul look like an Albino guitar. Anyway, this is an original Gibson that I thought some of you might like. Mind you, it is quite expensive. Fender Splatter - like a Crashocaster, but cheaper & cooler? 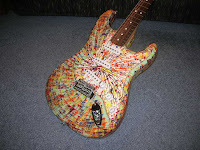 Back in 2003, Fender introduced the Splatter Stratocaster, a very cool model where each design was unique. 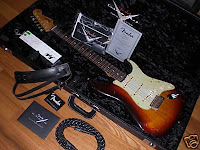 These guitars, which are sometimes also referred as the Splattercaster, were introduced as "Fender Standard Series Stratocaster models with Spin Art Finishes. 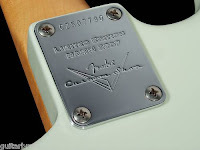 Each one of these new Stratocaster guitars are made just like the name implies - by putting finish on the guitar body and spinning it while still wet, each one virtually guaranteed to be unique" according to Harmony Central. The Splattercasters were Made in Mexico (aka. MIM) and were available for a limited time only. There are a few to be found on eBay at any time in the $500-800 range which is kind of a cool price for Strats with a unique finish. This clearly evokes the Fender Crashocasters - basically Fender Custom Shop strats painted by famous Graffiti artist Crash (Eric Clapton has 5). I think the Splatters are definitely as cool as the Crashocasters, if not more because I really like the surrealist approach and the random factor. And they come at a fraction of the price! Here are a few examples. Features are below, with an eBay search widget to help you locate your future one-of-a-kind guitar. Jimmy Page. Couldn't do my Gibson Les Paul Auction Week End without mentioning a few auctions of his signature model by the Custom Shop. Jimmy Page is forever associated with the Paul. And he is probably the first guitarist and the one that inspired many awesome players like Eric Clapton or Slash (or me :) to make it their own guitar of choice. There were a few Jimmy Page signature models created by Gibson in the last couple of years, including a "Black Beauty" Les Paul Custom and a replica of his 59 Les Paul Standard. Just 14 hours (as of writing) to get your hands on this beautiful Gibson Les Paul Standard 2008 and its Rootbeer Flamed finish. This is a gorgeous color that I hadn't seen to date. I really like it and I'm glad to add it to my Gibson Les Paul Auction Week End! "Gibson Les Paul - Studio vs Special" - this was one of my first posts. That being said, when you look at a Les Paul studio in a faded finish, it looks really good. So, then it's all about P90 vs Humbucker. Your pick. 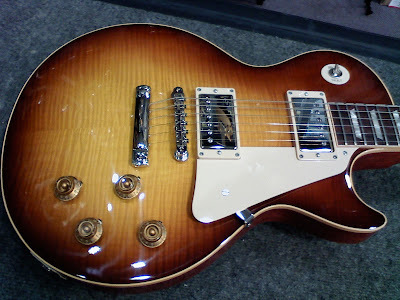 OK. Now, for a rare vintage Les Paul: the 55-77 Les Paul. Discover it by yourself. It is not only a rare model but it also looks really good in burgundy. As the other items I am featuring as part of the Gibson Les Paul Auction Week End, this auction closes very soon. Follow it below! As part of our Gibson Les Paul Auction Week End, here are a few Les Paul with very unique designs. Most are limited or very limited series, some by the Gibson Custom Shop. These are a bit pricey - between $1,500 and 2,250. But each is one of a kind and looks amazing. Be quick to bid because that's the rule of the Gibson Les Paul Auction Week End: most of these expire in the next 24 hours!